David A. Barlow, Ph.D., presently serves as the Director of the University Center for Health Professions Studies, Director of the College of Arts & Sciences Medical/Dental Scholars Program, and teacher of Gross Human Anatomy as a faculty member in the Department of Behavioral Health and Nutrition in the College of Health Sciences. 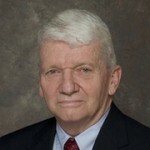 As a faculty member in the University since 1973, besides teaching he has held numerous administrative and leadership responsibilities, A well respected teacher, he is known for his excellence in advising undergraduate/graduate students in areas concerned with Exercise Science, Biomechanics of Sport, and Functional Human Anatomy. In the previous decades he served as a former Program Director/Department Chair guiding the curricular/facility/faculty development in support of rapidly expanding degree programs in the areas of Health Promotion and Exercise/Movement Sciences. For example he was a former Co-Founder of a Sports Science Center (Human Performance Laboratory) that was created in the late 1980’s and was initially instrumental in serving as a catalyst for faculty creation of graduate/undergraduate programs of study in Biomechanics and Exercise Physiology during the 1980’s and 90’s. He received his B.S. degree in Physical Education and Health Sciences from the University of Connecticut in 1963. From 1963 to 1968, he served on active military duty as a commissioned officer in the United States Navy. Following the Persian Gulf War in 1992, he completed an active affiliation of 28 years with the Naval Reserve receiving meritorious commendations and awards while serving as a Captain and Commanding Officer of several different Armed Forces Units recalled to Active Duty. With the aid of a United States Office of Education (USOE) Research Fellowship, Professor Barlow received a M.S. Degree under Dr. Richard C. Nelson in Biomechanics of Sport at The Pennsylvania State University. In 1973, he was awarded his doctorate in Biomechanics and Human Anatomy from Indiana University where his mentor’s were Dr. John M. Cooper and Dr. Sherwin Mizell. Professor Barlow, in addition to the teaching of undergraduate and graduate courses in biomechanics and human anatomy, was initially responsible for the development of a high degree of curiosity within our department concerning selected mechanical aspects of dynamic human performance in sport. He has also previously served as the Director of the Performance Division of the Association for the Advancement of Sports Potential (AASP), a former public foundation located in Pennsylvania. The primary purpose of this foundation was to aid in the scientific development of amateur athletes and in the prevention of high stress related injuries in the equine industry. His early principal research interests dealt with the biomechanical aspects of sport science/medicine. Over the years he has been the author of numerous Professional papers presented in various scientific journals/proceedings. Extensive presentations of scientific work (60-70+) have been given at professional meetings on a regional, national, and international basis. A dynamic speaker and respected professional, he was frequently invited to give talks and present research papers at national symposiums and sports medicine seminars all over the country. In more recent years he has been invited to serve as a Visiting Professor and Guest Lecturer teaching Kinesiology and Sport Science at Beijing University and other related Chinese institutions. Since 2003 he has been the co-recipient of several U.S. Department of State grants for the promotion of international relations through sport and education involving countries that include Turkey, Senegal, and India. Dr. Barlow is married to the former Jean R. Hamill from Manchester, Connecticut. He and his wife have two adult children, Jennifer (Banks) and Jeffrey, and currently reside in Hockessin, Delaware.